Police are investigating after vandals damaged the David Bowie statue under the arches in Market Square, Aylesbury, on Wednesday night. Blue paint was sprayed over the face, chest and knee of one of the two Bowie statues while what appeared to be the word 'grass' was sprayed in the same colour paint over a door opposite the statue. The vandalism happened sometime between 8pm on October 10 and 4am on October 11. Pavements and hoardings were also targeted but as of 8.45am this morning graffiti only remained on the statue and door. Friars Aylesbury promoter David Stopps, who led the campaign to create the statue in town said: "This is so upsetting, especially as we had Earthly Messenger professionally cleaned and waxed on Tuesday by the foundry who did the original bronze casting. "Bowie fans are coming from all over the world to see the statue and this really doesn’t do justice to the thousands of local people that supported this project. Police are looking at CCTV footage to see if the perpetrators can be identified and brought to justice. Councillor Julie Ward, cabinet member for civic amenities said: “I’m shocked and saddened by this mindless vandalism in Aylesbury. 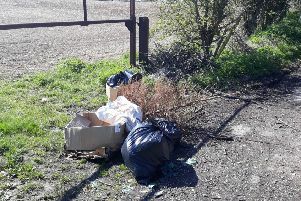 "Not only is it incredibly anti-social, but council tax payers will also end up having to foot the bill for the clean-up. "I’m also mindful of how upsetting this type of vandalism must be for our residents, visitors and the crowdfunders of the Earthly Messenger statue. Investigating officer PC Terry Lewis, based at Aylesbury police station, said: “I am appealing for anyone who may have witnessed this incident or who has any information that may help with this investigation. “If you recognise any of the symbols in the photos, please let us know. "I would also like to encourage anyone who owns a CCTV camera in this area to review the footage from Wednesday night into Thursday morning. “If you have any information, please get in touch by using our online form, quoting reference 43180311188 or by calling 101.